It’s that turkey time of year here in the US, and the colder weather makes me crave more comfort foods. Yet, it would be smartest not to gain weight before December’s usual slide into decadence. 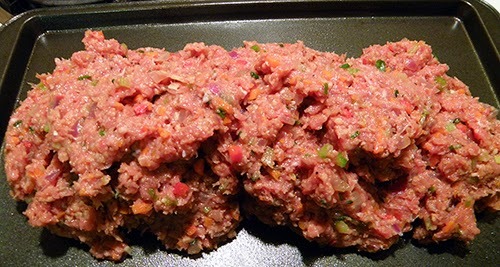 This spinoff from classic beef-and-onion meatloaf is chock full of healthful veggies and lower-fat ground turkey. My sister clipped this recipe from an unknown source many years ago. She presented it to me in a binder of family favorite recipes a few years back. She claimed to be starting her second “non-cooking decade,” and since I was just starting to cook family recipes, she dubbed this binder “The Cooking Decade.” Her kids loved eating this turkey loaf while they were growing up, and so will yours. Turkey Veggie Loaf is perfect for this time of year because it's hearty enough to stand up to cold weather and also takes advantage of the last of this year's red pepper harvest. The first key to this recipe is finely chopping all of the veggies, so that that the loaf will hold together and cook evenly. Use either a knife or a food processor. It will take a bit of time to chop everything, so allow at least 30 minutes, and more if you chop slowly with a knife like I do. 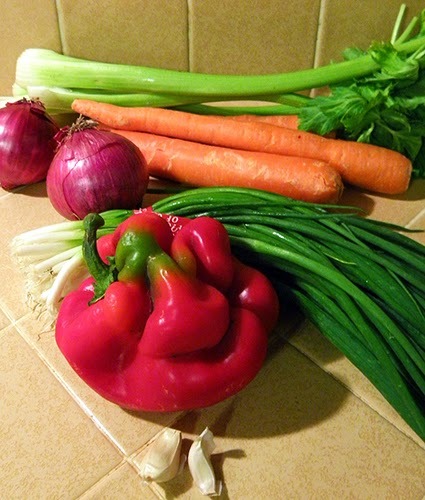 It’s best if the chopped veggies are ¼” pieces or smaller. Second key to the right flavor and texture is pre-sautéing the veggies. Do allow time for them to cool before mixing into the meat and adding the egg, otherwise the hot veggies will cook the egg in a bad way. This recipe makes a large quantity. Leftovers taste even better, as the flavors blend more. Slices are easily transportable for a delicious, satisfying lunch at work. The large quantity is also suitable for parties and potlucks. 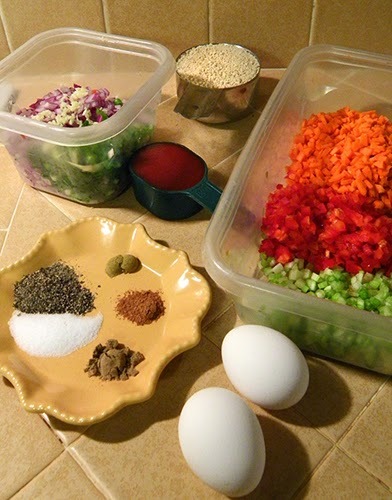 Since prep time is considerable, you can prepare it a day or two in advance and reheat at your convenience. Enjoy! Heat oil in a nonstick skillet over medium heat. 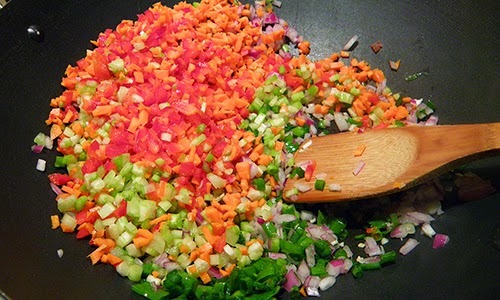 Add finely chopped onion, carrot, green onion, celery, red bell pepper, and minced garlic. Sauté until tender, about 5 – 7 minutes. Cool till close to room temperature. Stir together salt, pepper, nutmeg, coriander, and cumin. Place ground turkey in large bowl and break up with large wooden spatula or spoon. Stir in cooled, sautéed veggie mixture. Add breadcrumbs and spice mixture and combine thoroughly. Then mix in beaten eggs and 1/3 cup catsup until mixture is uniform. Spray a baking sheet lightly with cooking oil spray. 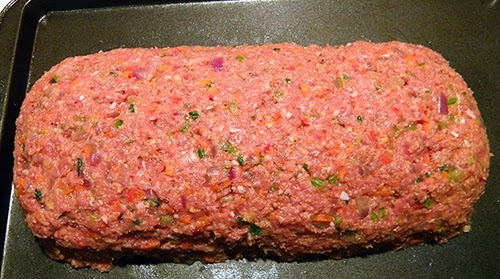 Shape turkey-veggie mixture into a loaf on baking sheet, approximately 6” x 11”. Bake turkey loaf at 350 degrees F. for 30 minutes. Meanwhile, blend together well ½ cup catsup and brown sugar. 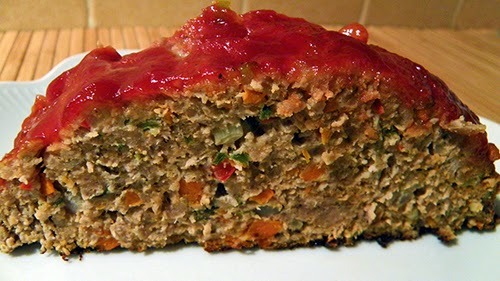 Remove turkey loaf from oven and brush catsup mixture onto top and sides. Return loaf to oven and bake an additional 30 minutes. Remove from oven and allow to rest/cool for 10 minutes before slicing.